. . . whew - that's enough of that . . .
Bill Brown retired after 36 years at WCBS-FM, New York in 2005. He passed away on October 9, 2011. This is Part Two of Brown's show from July 12, 1971. His radio career started in 1957. 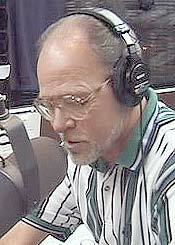 He was 15 when he first went on the air at WCLB in Camilla, GA., before moving to California and KICO, KAMP and KXO. From 1960 to 1964, Bill served in the U.S. Navy as a photographer. He worked on Project Mercury, while also on the Far East Radio Network (FERN) in Tokyo. After military service, he joined KGB in San Diego, and his connection to the Bill Drake-consulted station led to an offer at WOR-FM in New York City. He was hired by WCBS-FM in 1969. Part One of this aircheck is here, and Part Three is here.